Little, Brown Books for Young Readers, 9780316240772, 448pp. Adventure, magic, and hilarity collide in New York Times bestselling author Carrie Ryan and John Parke Davis's first book in a fantastical series. Heart-pounding escapades and a colorful cast of characters will have readers setting sail through this wholly original and unforgettable tale. Husband and wife Carrie Ryan and John Parke Davis have been in love with each other's writing (and with each other) since meeting in law school a decade ago. Carrie is the New York Times bestselling author of the critically acclaimed and multi-award-winning Forest of Hands and Teeth series, which is based on a world she and JP created together. She is also the author of Daughter of Deep Silence and Infinity Ring: Divide and Conquer, and the editor of Foretold: 14 Tales of Prophecy and Prediction. JP is the First Assistant Federal Defender for the Western District of North Carolina, as well as a published author of short fiction. 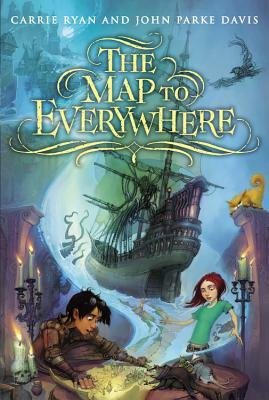 Although they've been important parts of each other's writing for years, the Map to Everywhere series is their first full collaboration. They live in Charlotte, North Carolina, and they invite you to visit their website at TheMaptoEverywhere.com.